Bleachorexia may sound harmless, but it’s a very serious disorder. People who feel like their teeth are never white enough and bleach their teeth over and over are said to have bleachorexia. A dentist coined the term a few years ago when he started noticing patients coming in over and over for bleaching treatments whose teeth were in really bad shape as a result of the over bleaching. When a person has bleachorexia they usually use home bleaching kits several times a week and see the dentist for more in-depth bleaching on a regular basis. But the overexposure to harsh bleaching gels and additives in home bleaching kits can destroy teeth. Someone who suffers from bleachorexia thinks that their teeth are never white enough, so they keep bleaching. But as they keep bleaching the enamel of the tooth is worn away. That leaves the inner part of the tooth exposed. The inner part of the tooth is naturally a yellowish color. When the person sees their teeth as being yellow they bleach again, which just makes the problem worse. Eventually the teeth become so weak and broken down that they crumble or fall part. Then the person has to endure root canals, crowns, and even implants just to fix the damage. According to dentists that specialize in cosmetic dentistry bleachorexia is on the rise. There is so much pressure on people to look great all the time these days that people are going to extremes bleaching their teeth constantly. In the era when selfies are popular and posting photos of yourself is expected everyone wants to look camera ready all the time. Having a white smile is expected, so people do whatever they can to make their smile look great. Unfortunately all that bleaching can destroy natural teeth. Using a natural tooth whitening product and using it responsibly is the best way to whiten teeth without causing massive damage to your teeth. Tooth sensitivity is a problem for a lot of people, but for people who use teeth bleaching kits and other harsh tooth whitening products tooth sensitivity can become a huge problem. Tooth sensitivity that is caused by over bleaching teeth cannot be reversed, because the sensitivity is caused by a loss of tooth enamel. Excessive teeth bleaching with strong whitening gels will wear down the enamel on teeth and leave the pulp of the tooth exposed. When the pulp is exposed the tooth will become extremely sensitive and painful. There is no way to replace tooth enamel once it’s been lost. There are two different application methods for teeth whitening gels. One method uses a tray that is filled with whitening gel and put over your teeth. The tray stays on for a certain amount of time and the gel is supposed to remove stains and debris on the teeth to make them whiter. The second method is when a dentist applies a peroxide based gel to your teeth for a cosmetic bleaching. The gel sits on your teeth for about 20 minutes and then the dentist uses a laser to amplify the effect of the gel. No matter what application method is used that gel is doing more than scrubbing stains off your teeth. It is eating through the enamel of the tooth. As the enamel breaks down and is washed away your teeth will become sensitive because the inner pulp of the tooth is being exposed. The more you bleach, the more pulp is exposed. Even though sensitivity won’t cause any tooth loss it can still make life difficult and painful. Eating and drinking can be painful. Even the weather or allergies can trigger pain in your teeth if the enamel on the teeth has been worn away. You may have to give up some of your favorite foods and drinks if the sensitivity is severe. Living with tooth sensitivity won’t get any easier because the enamel cannot be replaced. Sensitivity is a permanent condition. There are a lot of things that can go wrong with your teeth when at home teeth bleaching kits are used. Sometimes cosmetic dental whitening can cause problems too, but the most severe damage to teeth is usually done by at home whitening kits. 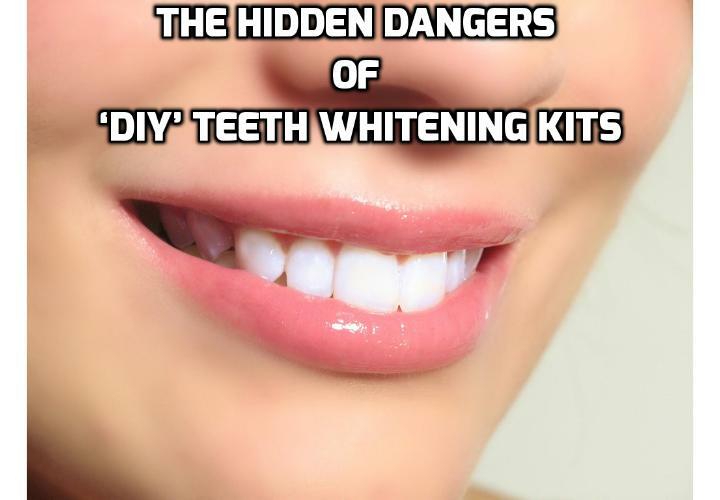 That’s because people don’t always use those kits correctly and because they don’t realize how damaging the whitening gel can be to their teeth and gums. Some of the problems that can occur when home teeth bleaching kits are used too often include sensitivity, gum irritation, and bluish enamel around the edges of teeth. Seeing bluish colored enamel on teeth is a sign of a very serious problem. It’s common for teeth and gums that come into contact with whitening gel to appear white. But if you notice that the enamel on your teeth has a bluish tint that means that the dentin of your teeth is exposed. Dentin is the bony tissue that lies under the enamel on a tooth. If you are seeing bluish colored tissue on your tooth that means that bleaching has destroyed the enamel on that tooth. Once that enamel has been destroyed there is no way to replace it. Enamel is there to protect the dentin and the pulp of your tooth so if the enamel is gone it means that your tooth is at risk of damage, infection, and you may eventually lose that tooth. Bleaching the teeth with at home kits makes it easy for people to make mistakes. Leaving the gel on too long or using the whitening kit too often will wear away the enamel on the tooth. Even if you think you are following all the directions correctly there is a good chance that the tray that is supposed to fit over the teeth won’t fit correctly because it’s not custom made for your mouth. Nowadays there are several solutions for a bright, white smile which vary greatly from those of ancient times. One such method is whitening strips. The latter are made up of polyethylene. This is a flexible material consisting of hydrogen peroxide. Humidity is caused when you apply these strips to your teeth and a chemical reaction takes place. A mild acid is formed which removes some teeth stains. Before using whitening strips you should visit your dentist. The latter can identify the causes of discoloured or stained teeth. When this is done, you could decide which teeth whitening method is best for you. Brown or grey teeth stains are difficult to remove by whitening strips whereas yellow stains are eliminated more easily by using whitening strips. When using whitening strips you should take note of the manufacturer’s instructions. When you know how to use these strips they yield positive results. However, you should not use these strips always because they can harm the teeth enamel as well as the tissue under the gum. Moreover, prolonged application of whitening strips causes your teeth to become transparent thus appearing darker. Also, you should avoid exposing the gums to these strips as this can cause irritation. A natural whitening solution is therefore a better choice because it will not destroy your enamel but will give you a brighter and whiter smile. Next PostNext Why Natural Teeth Whitening is the Best Way to Whiten Teeth?